Discussion in 'General Discussion' started by Steve S, Aug 18, 2005. Got a Light Tent with intentions of eventually going into shooting products part time, in particular jewelry. What I didn't realise, is how hard this is to do well! I had no clue where to put my Alien Bees strobes. I used just the bare bulbs for these shots, with, let's just say, "mixed results". These are very boring objects that were just laying around the barn studio. If anyone has any tips on how to get better, let's hear it! Thanks :? PS, these were shot with my new Tamron 180 Macro, manually focused the min aperture of @f32! Think I may need a focusing rail. I don't know Steve, they look pretty good to me, I'd like to be able to take pictures that look that good. I know they can be better, and I really wanted to practice on jewelry, but I don't have any! Hi Steve, are these for a job or just practice. I have not shot product shots so take what I say with a grain of salt. The most difficult thing is to control the reflections and here these images are lacking. The bottle shows the reflection of the brushes, the glasses show a monitor, and the batteries show a reflection of the battery to their right. Positioning is critical in product photograpy. Hope this is the type of feedback you were looking for. So where to begin? First of all take the light tent back to the store. They have a tendency to flatten out the light too much. shooting commercially for 20+ years. You are not ready for jewellery. It is one of the most challenging of all subjects to photograph well. Get some catalogues and really look at the lighting that is being used. to us with shots that look like this. I like my critiques without any suger coating, thank you, so I appreciate your candor and frankness. I do have a set of softboxes, a full length, a 47 in Octabox, and a med rectangular, so maybe that's what I need to practice with instead of this lightbox. This is a LOT harder than it looks! with and learn from some very good photographers. teaching something that you are passionate about is a gift. So don't hesitate to ask. This is one of my new promo pieces. Notice how all of these shots have a direction to the lighting? Robin seems to have this covered, but I would add, "look at your product/photo, does it look appealing? does it convey it's function or manufacturer?" In the first shot the make-ups is caked on the jar and the brushes have stray hairs, I would actually trim the brushes to be neat and work on your make-up stuff to present it better. That may be over-manicuring a shot, I don;t know. In the second shot the sunglasses are upside down dude. The picture makes me want to stand on my head to view it.. anyway, it doesnt make my mind think about how they would look on my face (right side up), it doesn;t show me how the world looks through them, it kinda looks like how someonw would abandon glasses they didn;t like. Wow! Those pics make me really hungry. Can almost taste them through the monitor. I think that is the point. As you point out there is a much to know about different types of photograpy. You make it look simple. And I have much to learn. Welcome to my game. If you have any questions don't hesitate to ask. I hope that offer isn't exclusively to Steve, Robin. You must described me . 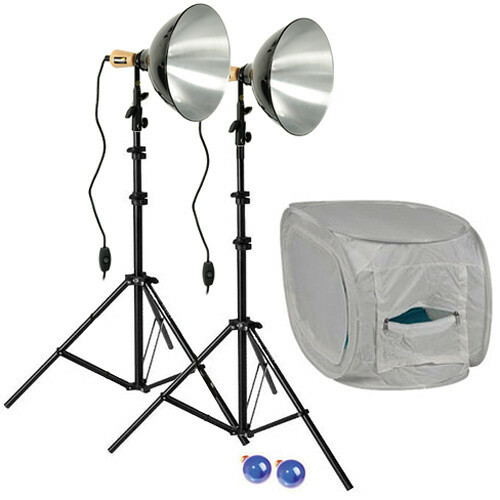 And to make it worse, I'm the guy that's been touting the light tent rig from BH Photo :shock: . My first shots with it were of my lenses which was pretty easy. Then I tried jewelery... well, actually a cheap watch :-/. Fortunately, the product shots have been of PC boards, and they're simple shapes. One big problem I've had is matching the angle of presentation with the client's standard. Any critiques or words of wisdom will be greatly appreciated. don't hesitate to ask. Lighting is everything in photography! Light Tents and Light Cones do have their place, for some subjects. represented by proper studio lighting techniques? Absolutely. What these units do also is eliminate the need to learn how to light. the photographer with a project, lets say a battery shot for Wallgreens. the client for drumscanning, page placement, and eventually press. Recently the trend is not to hire the professional to do this work. the solution to work being poorly shot by folks who don't know how to light. ago. It is quite obvious that the quality of the photography has declined. in the commercial world we have seen this trend begin to reverse itself. they have been using is not where it was in days gone by. to control light. A photographer can." Lighting is the key! correctly light the subject will improve your shots immensely. if I ranted, but...... JMHO. You must be a really young guy to refer to 6-7 years ago as the "old days" -lol! For me, the old days were when Elvis made his first appearance on the Ed Sullivan show. Any specific help/suggestions you can offer me on my samples, Robin? the black surface from plugging up. different areas of the tent. Thanks for the input, Robin! I'll give those suggestions a try. Hehe... Are we playing critique my product shot? Poor Robin. I wanna play too. I can never get those awsome critiques you gave. I didn't even notice all the things you mentioned to Steve till you pointed them out. I've tried photographing jewelery, and gave up in vain. It takes me hours and 1000s of shots to get the lighting to look half-way decent, and I still don't like it. I don't have a lighting tent, considered getting one, but decided it wouldn't work for my situation, as my products vary in size. I usually shoot with 2 or 3 strobes - main, fill, and background. The biggest problem I have is getting the background to blow out without having the light wrap back around the product. How the *ell do you light it so you don't get crazy burnt out hotspots? Thanks Robin, I look forward to your response. I was thinking the same thing after seeing Paul's stuff.